Selling at JBF - Just 3 Steps! Just Between Friends families that sell with us earn an average of $350 at each sale and so can YOU! Your Registration costs come out of your Consignor Check, no upfront charges! Mark all items Reduce AND Donate to have your Consignor Fee reduced to $6! Download our Consignor Guide HERE for more details! VOLUNTEER REGISTRATION will open on April 1st!!! Be a part of the #JBFSNH Community and make YOUR sales event great! The online Volunteer schedule opens on April 1st. 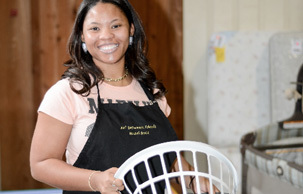 Volunteers who complete a total of 4 hours earn 65% on their sold items. Volunteers who complete a total of 8 hours earn 70% on their sold items. All Volunteers receive 3 tickets for Saturday's Half-Price Presale! The more credit hours you complete, the earlier you get to shop! The earlier you shop, the more merchandise and bargains to be had + you EARN more...win, win! The Volunteer Scheduler closes down on Monday, May 13th in order for us to get the everything in order. Please have any shifts added or make any changes by that time. If something arrises after May 13th and you want to add or need to change/cancel a shift PLEASE email CarinaeSamsel@jbfsale.com with the information as soon as possible. Thank you. 1. If you are a High Volume Consignor (dropping off more than 300 items), and you wish to pick up your unsold items, you are required to sign up for the 2p-7p High Volume Consignor breakdown shift. *If you are donating all your unsold items this is not a requirement. Click the link HERE to schedule your May 2019 Consignor Drop-Off Appointments . 1. Get your Drop Off appointment time/day ticket through the link as soon as possible. EVERY Consignor must schedule a drop off time and arrive for their scheduled appointment for drop off. 2. Park in the front parking lot of The Hampshire Dome and grab 1 cart to bring your items in (please no more than 1 cart). Check in at the table in the lobby. We will scan one of your tagged items to import your inventory to our system and you can then place your items out on the sales floor in the appropriate spots. 3. You may use ONE of our carts (if available) to bring your items into the building and place them on the sales floor in the appropriate areas. If you have your own wagon or cart, we recommend bringing it so you don't have to wait for ours if they are all in use. Clothes/shoes will be organized by gender/size and other items grouped by category. Any items such as beds, pack and plays or anything that requires assembly MUST BE ASSEMBLED ON THE SALES FLOOR BY THE CONSIGNOR. Please bring appropriate tools for your items. You will also attach the provided large item claim tickets to any bulky items that are too large to fit into an Ikea shopping bag. We will show you how to do that at drop off. All items are inspected AFTER drop-off. 4. Bring your signed Car Seat Checklist, and Crib Checklist (if applicable) and place them on your items on the sales floor. ALL CAR SEATS, BOOSTER SEATS AND INFANT SEAT BASES MUST HAVE A COMPLETED CAR SEAT CHECKLIST. All actual cribs (not pack and plays/bassinets or porta-cribs) must have a completed Crib Checklist. 5. Check out at the table on your way out to get your presale passes! That's it! Note: Find more items to sell? (no clothes or shoes accepted at this time) You can bring them to the mid-sale drop off, from 8p-8:30p on Friday, May 17th. At 8:01pm remaining items are donated to our charity partner The Pass Along Project. Sorry, no exceptions! Register to Consign -OPEN NOW!!! Diaper bags, infant carriers, backpacks, lunch boxes and kid's purses are great consignment items. Please inspect all items carefully to make sure items have not been recalled, stained, damaged or are missing pieces. Please no women's handbags unless they are diaper bags. Bedding sizes accepted are bassinet through double/full only. Package: Blankets should be secured to hangers. Put bedding/crib/bedroom sets together in original packaging or in giant clear plastic bags. Arrange bedding sets inside bag so that shoppers can see all of the items as well as the design/pattern. Secure the bag so that items do not get separated. Bundle blankets, cloths, and towels with ribbon or string like a package (be sure multiple pieces cannot be separated). Tag: If bedding is in a plastic bag, attach tag securely with packaging tape to the inside of the bag and tape the bag shut (bedding set prices vary widely and securing tags inside bags prevents tag switching). If bedding/blankets are bundled with string, attach tag directly to blanket and tuck it under the ribbon/string so that it does not easily get pulled off when shifting around during the sale. Click HERE for related tagging video! Books, book sets, board games, puzzles, video games, video game systems, scrapbook, arts & crafts sets are great items for resale. Please only bring kids’, parenting, homeschooling, pregnancy and child rearing books. Games and puzzles must have all pieces. No "adult" content or rated "M" video games. We are unable to accept VHS tapes. Check dvds and video games for scratches and double check to ensure the disk is in the case! Tag: When tagging books, please attach your tag to the book with clear tape that can be removed without damaging the item. Tape tag to the outside cover of glossy books and to the inside cover of books that will easily tear when removing the tag. Please do not use masking or double sided tape. Hole-punch JBF tag and tie to sets. Click HERE for the Book, Game, DVD tagging video. We sell children's clothing Newborn through size 18, as well as maternity sizes. Our Spring Sale is going to be an All Season Sale so may bring in items from any season. Be picky. Look at your clothing items as if you were going to purchase them. No stained or damaged items will be accepted. Any junior's items that look like "mom's" clothes will be rejected at inspection. Please freshly clean your clothing items. Replace missing buttons, sew loose hems and seams, and clip loose threads. Please button all buttons, snap all snaps, zip all zippers before you arrive at drop off. This will ensure that there are no defects in the clothing. The newer the item looks (and the better it smells), the better it will sell. Package & Hang: Hangers - Please hang clothes so the hanger hook points to the left (like a question mark). Try to hang clothing on size appropriate hangers or secure them to the hanger with safety pins. Clothing that falls off the hanger onto the floor does not sell well. Old Navy and many outlet stores are great places to get free hangers (they throw away hangers daily!) and WalMart & Target sell child-size plastic tube hangers at a great price. Pants/Shorts - Pant-clip hangers are great but if you use a standard hanger, simply use your tagging gun or safety pins to attach pants to the top part of the hanger so the garment will not slide. Onesies, socks, tights, hats and infant mittens need to be in a clear zip-lock bag (you may group multiple items in one bag). Please be sure to label your tag well so that customers know if the items are short-sleeve onesies or long-sleeve onesies. We DO NOT have a $3 rule at the JBF Southern New Hampshire sale. We encourage you to price your items competitively and use the provided guide as a resource. Tag: Clothing on Hangers - Attach tag with a tagging gun to the label of shirt or safety pin to the upper right front of clothing. Insert the tagging gun in a label or inside seam NOT through part of the clothing (to avoid making a hole or tear in the clothing). Also, pull on the tag to make sure it is properly secured and will not come off easily. Please make sure consignor tags are pulled out of the clothing so they are easily visible to the customers. Click HERE for the How to Tag Clothing video. Exersaucers, swings, high chairs, changing tables, strollers, bath seats, baby walkers, car seats & car seat accessories must be checked for safety recalls, must have all parts, and be in good condition. Check HERE for the Consumer Product Safety Commission (CPSC) website to check for recalls. 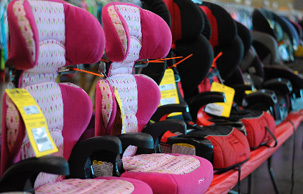 Car seats, booster seats and bases MUST be at least one year from expiring. Any of these items that expire sooner than one year from the date of the sale will not be accepted. (Look at the bottom/back of your items for the expiration date) Please bring a completed Car Seat Checklist in to drop off with you. Download is available at the bottom of this page. We accept Cribs that were manufactured AFTER June 28, 2011; please bring a completed Crib Waiver for all cribs. Waiver available for download at the bottom of this page. NO dropside cribs can be sold at all, not even as a toddler bed. Children's furniture - beds (toddler, twin), desks, side tables, dressers, must be checked for recalls using the CPSC website link HERE, as well as have all parts and be in good condition. Tag: If the item is so large it would be hard to carry while shopping, when you arrive for drop off, we will give you a Large Item, perforated yellow tag to attach your tag to. That yellow tag is then attached to the item to allow shoppers to claim the item without having to carry it around. If it is not too large to comfortably walk and shop with, attach JBF tag directly to item with clear packaging tape or hole-punch JBF tag and tie it to item. Click HERE for a How to Tag Large Items video. Package: If an item has multiple pieces, use packaging tape, tagging gun, safety pins or clear self-seal bags to keep items attached together and clearly visible to shoppers. Batteries must be included, if applicable. Click HERE for a How to Tag Infant Items Video. Make sure that shoes are clean, clean, clean! We will be VERY selective with shoes during Consignor Drop Off & Inspection. Magic Erasers work miracles on the rubber toes an sides of the soles. Shoes must be current season (Fall = October thru April; Spring = May thru September). Click HERE for a How to Tag Shoes video. We will accept stuffed toys that are characters (such as Mickey Mouse or Dora), battery operated (like Tickle Me Elmo), Build-A-Bear, or Beanie Boos (they have the really big eyes). Please no generic or Beanie Babies. Tag: If the item is so large it would be hard to carry while shopping we will give you a Large Item, perforated yellow tag during inspection to attach your tag to. That yellow tag is then attached to the item to allow shoppers to claim the item without having to carry it around. If it is not large, attach JBF tag directly to item with clear packaging tape or hole-punch JBF tag and tie it to item. Click HERE for a How to Tag Toys video. Tagging Guns- are cheap and make tagging so much faster! You can get sometimes get tagging guns at places like Michael's, Walmart, fabric stores etc. Cardstock- 60lb or higher, can be purchased at any office supply store or picked up at Walmart. Please ensure you use WHITE cardstock, not regular printer paper to ensure your tags don't rip easily. Items tagged with printer paper instead of cardstock will be rejected during inspection. Safety Pins- #2 or #3 size pins are recommended and can be purchased at any fabric supply store or Walmart. Hangers- Try to hang clothes on size appropriate hangers. Size 4T clothing and under hang better on kids size hangers and larger sizes on adult hangers. Many stores will give you hangers for free if you ask them, or you can buy the kids and adult tube or wire hangers for fairly cheap at Walmart or Target. Once you register to consign, make sure you join the Facebook Consignor Group for quick response answers from seasoned Cosignors and us! We will hold a few Facebook Pajama Parties leading up to the sale. These are hour long live events, usually at 9pm (after kiddos are in bed!) where we post great info, give away prizes and are online to answer questions. Ensure you RSVP "Going" for the current Facebook Event pinned to the top of our Facebook page to get notified of when the next one will be! Schedule a One on One! Is all of this a little overwhelming? Do you learn better by conversation? We are happy to provide a One on One conversation where we can guide you through the process and answer any questions you may have. Please contact us to schedule a One on One. Consignor checks are NICE & BIG when each Consignor shares in getting the word out about JBF! Word-of-mouth advertising is the best form of advertising, and market research has shown that it takes 10 Shoppers for each Consignor to sell the majority of their items at the event. We can't do this without YOU! How many Free Admission Passes can you hand out at your daycare, preschool, church, ob/gyn, mom's group, etc? Email us with your home address and how many passes you want and we'll send them to you! Other ideas are to send out emails, forward our JBF emails, share our Facebook posts, and send the link for a Free Pass or coupons with friends, family and other mommies you meet!